Beth grew up in Virginia, and from a young age had an interest in science, especially in astronomy. She was her class valedictorian when she graduated in 1987 from high school and she went on to study astrophysics at Howard University in Washington DC. 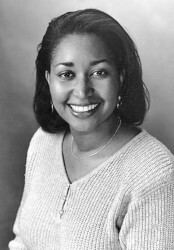 She earned her Master‚Äôs in Astronomy from the University of Michigan and made history in 1998 when she became the first African-American woman to earn a PhD from the university‚Äôs Department of Astronomy. In 2001 Beth held a National Academy of Science and National Research Council Postdoctoral Research Fellowship at NASA‚Äôs Goddard Space Flight Centre (GSFC). After this she began working at the National Space Science Data Centre where she focused on education and outreach as well as working on a number of data archival activities. In 2006 she became an Astrophysics Fellow at the GSFC which led to her becoming a visiting Assistant Professor at Howard University. While working at Howard University she developed a new course titled Naked Eye Astronomy which gave students with¬†no previous experience in astronomy the chance to study it without the use of a telescope. It is still be offered at the University today. Another way she tried to encourage people to engage with science, in particular astronomy and astrophysics, was to work with organisations such as the National Society for Black Physicists and the National Conference of Black Physics Students. Both of these groups help and encourage minorities and women to study and work in the field of STEM. Sadly Beth died suddenly 2008 but her hard work and dedication to her field will leave a lasting legacy for her.